For decades, researchers at the nonprofit Down East Institute for Applied Marine Research (DEI) have been studying lobsters and other shellfish with the goal of supporting sustainable fisheries and launching aquaculture ventures for local communities. Located on Great Wass Island in downeast Maine, a region where the link between the health of the natural landscape and the vitality of local communities is dramatic, DEI raises wild clams, scallops, and lobsters in hatcheries, then moves them to ocean nursery sites where they grow large enough to survive in the wild. The institute had outgrown its original facility and sought a much larger home. 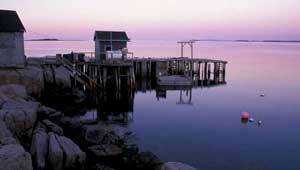 In 2006, TPL acquired an option on an eight-acre former lobster pound at Black Duck Cove and, through the hard work of Maine Senators Olympia Snowe and Susan Collins, Congressman Mike Michaud, and State Senators Kevin Raye and Dennis Damon, helped DEI secure federal and state funds to purchase the property. DEI will use the site for applied marine research, a public hatchery, a business incubator and a marine education facility where students and future fishermen can learn about the area's shellfish habitat and its link to the vitality of their community.